Shark ReefRas Mohammad, Egypt, originally uploaded by Craig Grobler. Shark Reef and Yolanda Reef are two reefs rising just off the Ras Mohammed coast. They are twin peaks of a single coral sea mount, separated from the mainland by a shallow channel. Shark Reef is the more colorful and spectacular of the two reefs; with its wall and great marine life. Yolanda Reef is the larger of the two. Its name comes from a vessel which sank here in 1980. 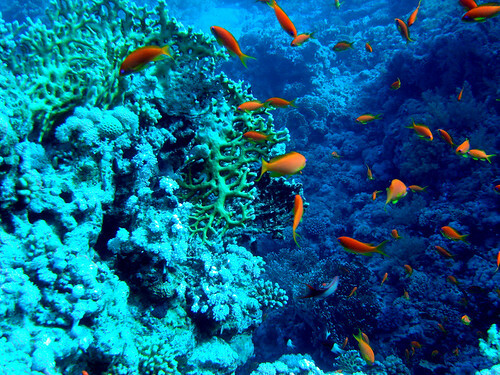 Sharm el-Sheikh has also become a favourite spot for scuba divers from around the world. Being situated near to the Red Sea, it provides some of the most stunning underwater scenery and warm water making this an ideal place to dive. Visitors to Sharm el-Sheikh can experience a variety of water and activities. Beach seekers find many activities such as diving, snorkeling, wind surfing, para-sailing, boating, and canoeing. Ras Mohammed is the National Park of South Sinai and located on the very tip of the Sinai Peninsula; it probably represents some of the most famous dive sites in the Red Sea with 800-metre (2,600 ft) deep reef walls and pounding current and coral gardens.